Can I Paint My Log Walls? From dark and rugged to light and fresh, painting log walls is one way to completely change up your cabin's personality. It's true that most people love wood in the mountains. 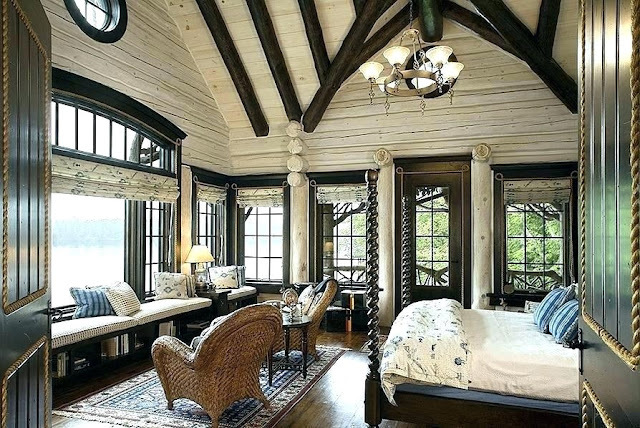 Everyone seems to want wood walls, wood floors, wood ceilings and as much log trim as possible. Most of us love wood and can't get enough, but some of us don't. Is your cabin a little too heavy on the wood for your taste and the way you want to live? What are some of the reasons why you might consider painting over your log walls? Wood everywhere can tend to make interiors dark and gloomy. Painting with a fresh light color can fill your rooms with light. Wood walls, floors and ceilings can make smaller rooms feel like they are closing in on you. Using lighter colors, especially white can give your rooms a little breathing room. 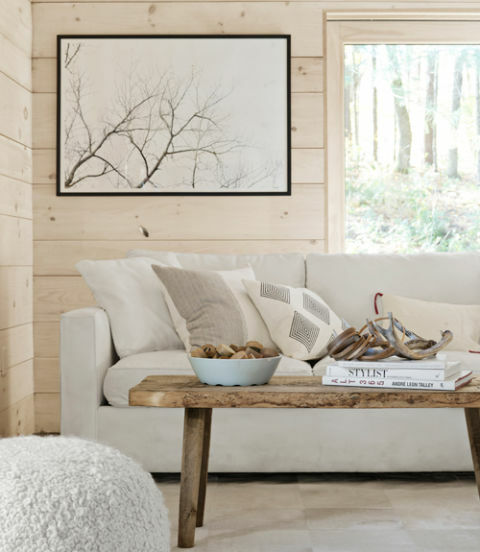 Lots of logs and wood are definitely a traditional cabin look and if you're going for fresh and modern, it's just not going to happen if you leave the logs natural. Funky, dirty and just plain old woodwork can be cleaned up with paint. See for yourself. 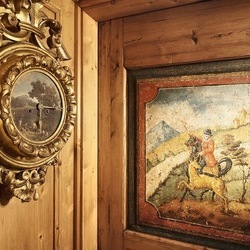 Below are a series of photos of log cabins owned by courageous buck-the-norm folks who painted their walls (and often ceilings too), creating beautiful, bright and unique mountain interiors. 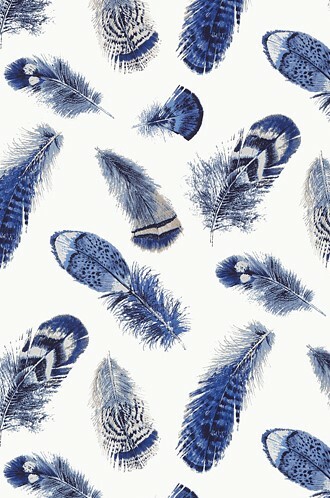 Do you have the style chutzpah to follow their lead? High gloss white paint. Modern quirky furnishings and accessories add to the look. Black and white for a statement-making look. 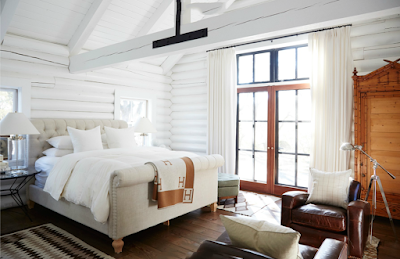 A dark room goes light and airy with white paint, white curtains, and an all-white bed treatment. White stained logs contrast with beautiful dark wood trim and ceiling beams creating a light interior with a traditional feel. 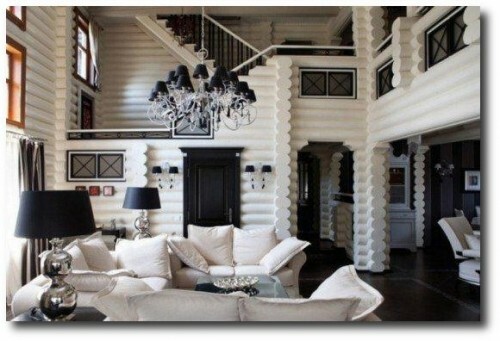 Soaring white walls and ceilings mix with soft, pale, comfortable furnishings to create a cozy and welcoming interior. 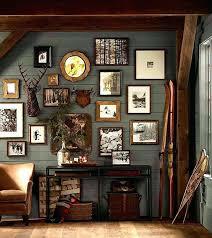 Soft warm grays are popular everywhere right now and work beautifully on log walls. Wood walls painted green while beams and floors are left natural creating a sophisticated mix. Stain works for interiors, too. A soft grey stain serves as a appropriate backdrop to edgy contemporary furnishings and colorful artwork. It seems like modern construction and decorating is definitely starting to impact large-scale high-end mountain projects. However, I don't see it having much influence on more moderate projects. 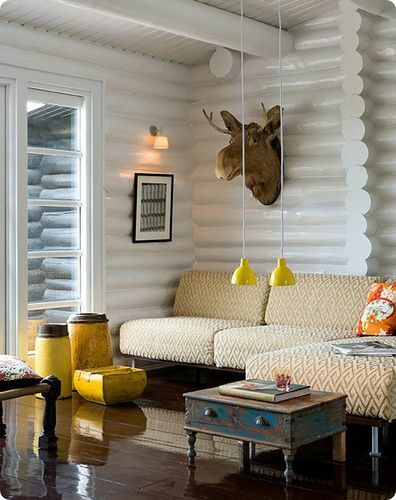 That's one of the reasons that I really like this modern cabin, originally published in Country Living. It's pretty rare to see a normal family sized cabin, designed with these airy, light modern surface materials and contemporary interior furnishings. 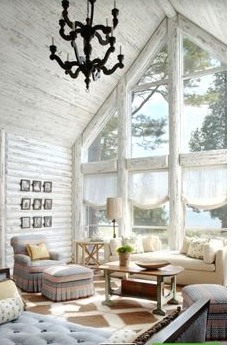 I am really appreciating all the pickled pine wood and the white color palette. This room is so smart looking and it's really all due to the light colors in the woodwork and modern shaped furnishings. 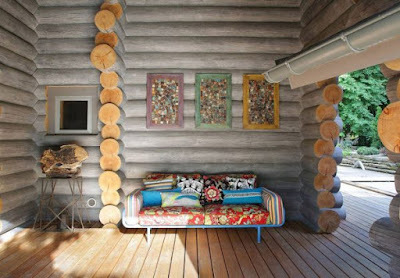 These choices are really no more expensive than the typical rich wood and brown sofa look you see so much in cabins. One of the nice things about choosing to design and decorate in this style is that part of the look is open empty space, which means you need fewer, although carefully chosen, furnishings. In this case, there are a number of statement making pieces, such as the two light fixtures, the dining table and chairs and the crazy furry pouf. Although this house gives a modern impression, it is actually an old ranch style house in the Berkshires, remodeled by Hauswork Design. Formerly dark, dingy and depressing, most of the materials got a contemporary face-lift, except the fabulous stone fireplace, found as is on the site. And, of course, a piece or two of over-scale high-impact art is required. When a room is mostly in whites and creams, it's important to use a lot of textures so that it doesn't become too bland. In this case, the rustic wood bench used as a coffee table, the tongue and groove on the wall, the white hair hide on the floor and the nubby fabrics all keep the eye both soothed and entertained at the same time. 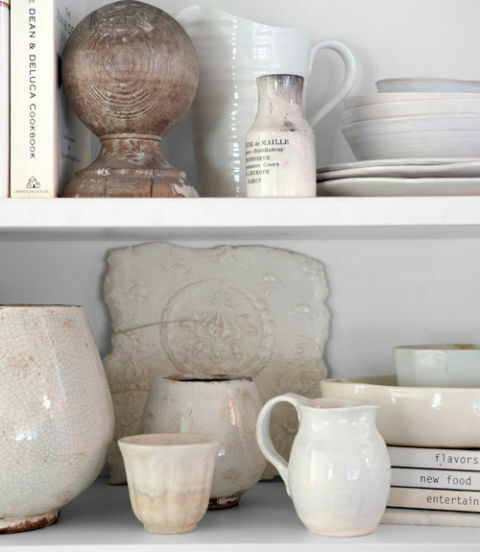 Interesting collections united by the white color scheme add additional eye candy. 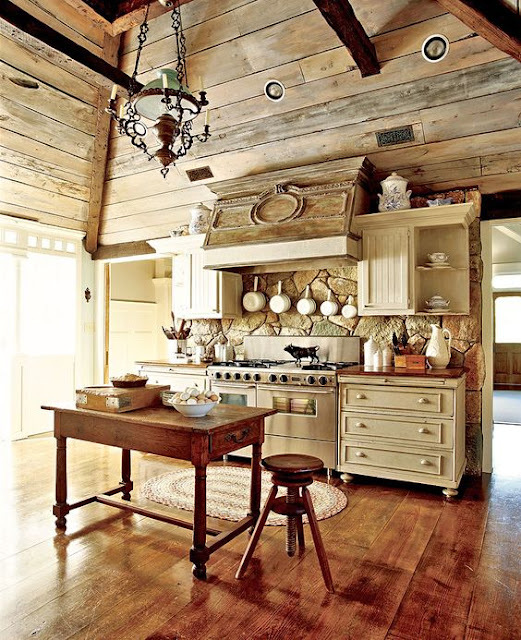 In the kitchen, the theme continues with natural woods contrasting with more white. 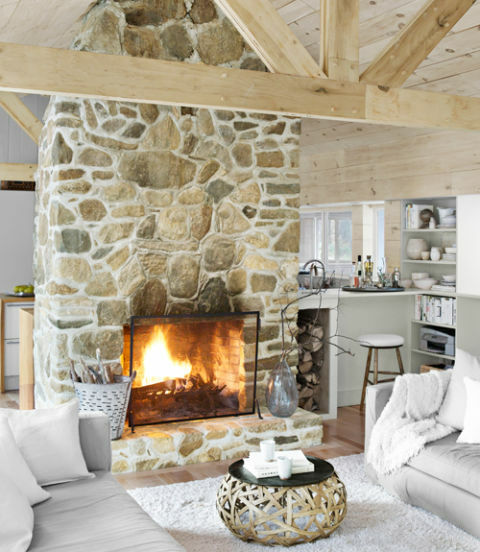 The mortar on the stone chimney is very white and has been left thick so that it, too, makes a white statement in the room. 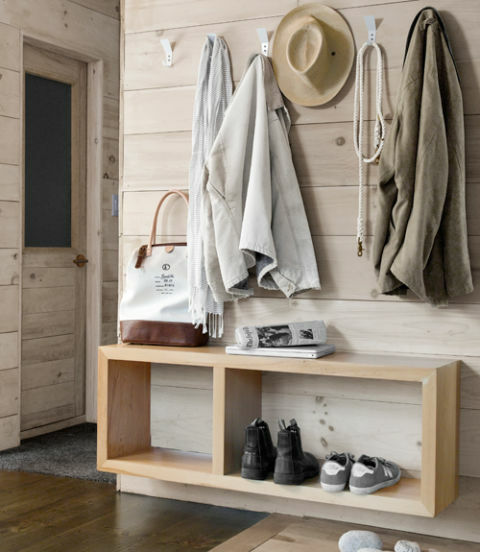 A simple but stylish entry. A sliding barn door system with horizontal planks adds modern interest to a wall in the master. A simple contemporary natural linen bedding collection in lots of textures keeps things clean but stylish. A lot of the furnishings and soft goods were purchased at stores like Ikea and West Elms and Bobby Houston of Hausworks pickled the pine walls himself. Carefully adding in a few authentic and collectible mid-century modern pieces and splurging on a few modern elements elevates the entire design. 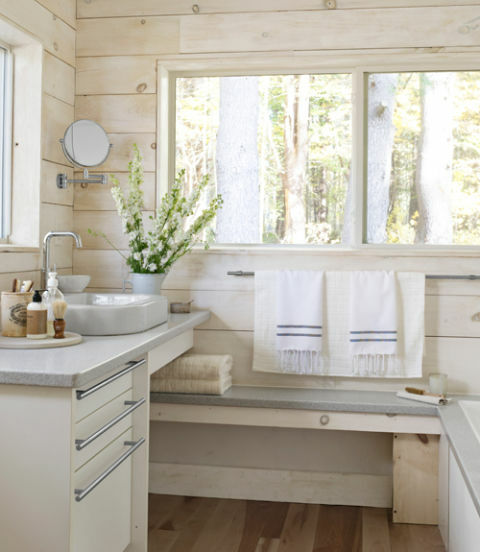 The most modern cabinets, hardware and fixtures contrast with the rustic wood siding. No color allowed. 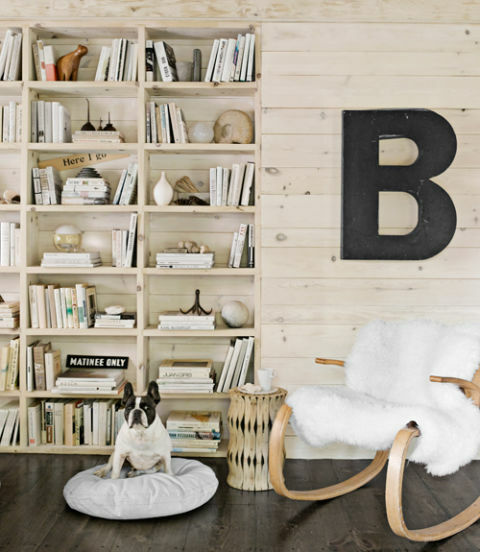 Even the dog slips beautifully into the neutrals color palette! 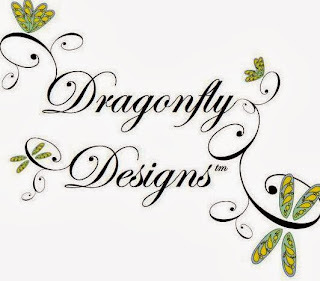 If you love a quiet color palette, see our cream and white fabric collection and our cream and white wallpaper collection. What do you do when you love your small cabin but your family needs more space? 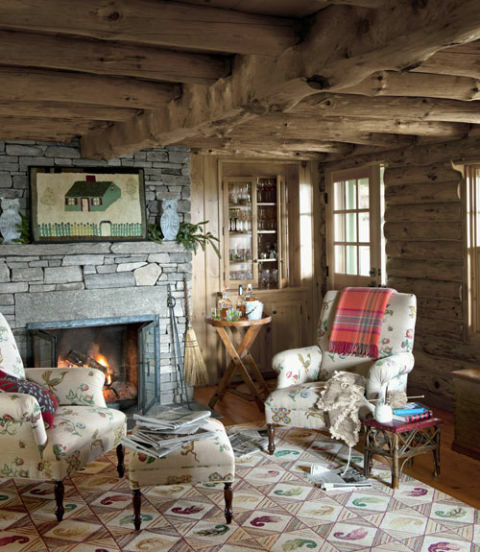 The Bacon family solved the problem by leaving the original Vermont log cabin intact and building rooms around it. In the photo below, you can see the original outside walls, which are now indoors. The Bacons are lovers of camp and cabin antiques. The island in the new kitchen area is from the 19th century. The hickory hoop chairs are from the 1930's. The kitchen has been accessorized with a collection of tin plaid picnic boxes from the 40's and 50's. In the great room, older upholstered chairs have been recovered in a classic Lee Jofa floral fabric. Leslie Bacon collects old hooked rugs and there is a large beautiful example on the floor and a smaller cabin-themed hook rug hanging above the fireplace mantle. 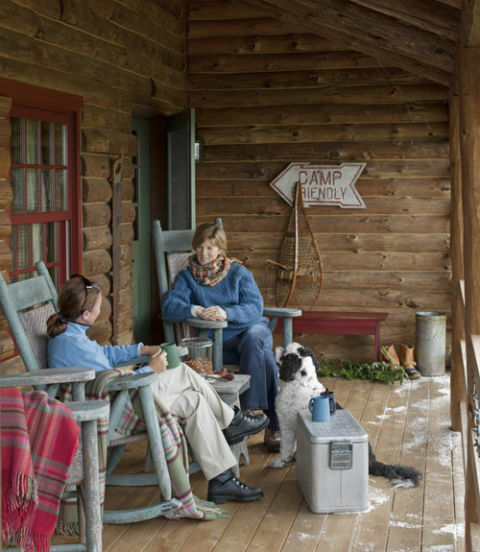 On the front porch, comfortable old rockers supplied with wool plaid blankets provide a cozy place to sit with a hot cup of cocoa and watch the snow fall. Vintage accessories contribute to the charm of the porch. 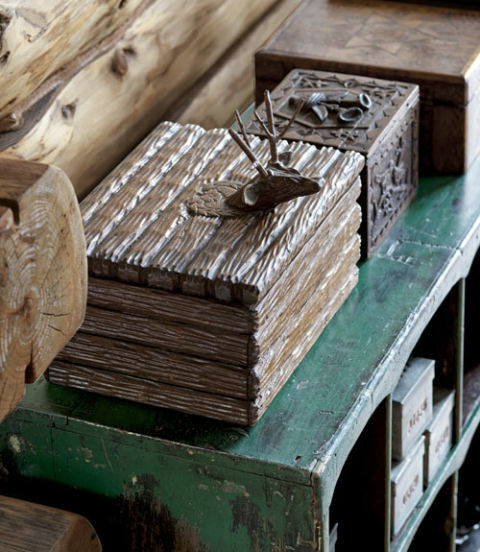 Old carved Black Forest boxes are shown to advantage on an old store display rack. The master linens are all vintage along with the braided area rug, above and below. 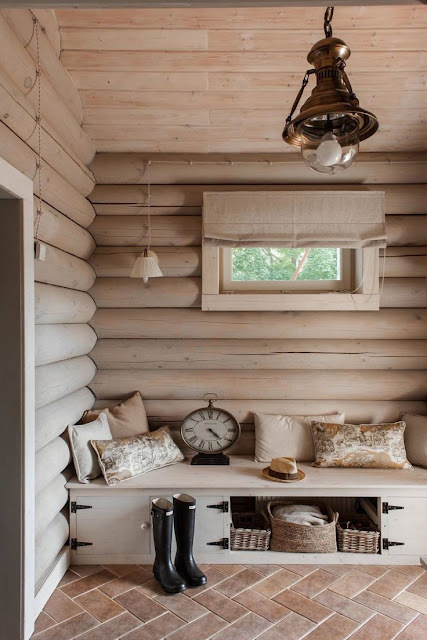 Classic cabin arts from the hand-made quilt, pine cone lamp, hand-woven basket, cabin mirror. The log walls create a charming backdrop for the Bacon's pretty collectibles. 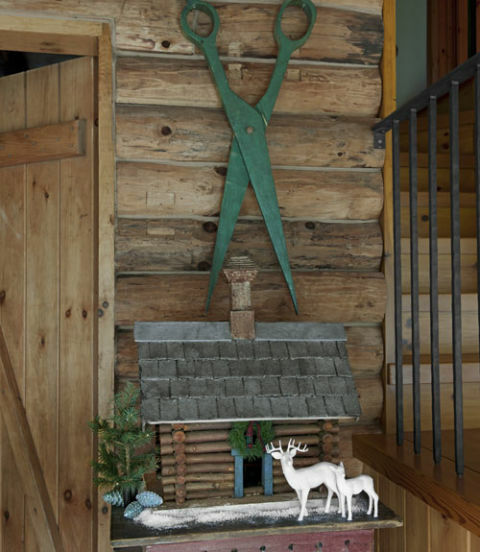 A charming old hand-made cabin and scissors that were once part of the signage on a tailor's shop. 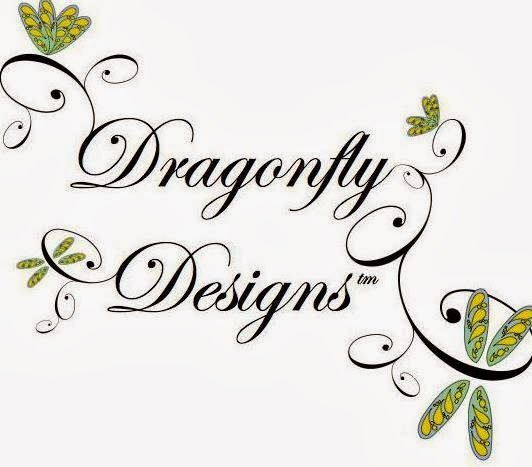 Although the many collectible pieces are from different eras and sources, they are kept cohesive with a color palate made of muted greens, red, yellow and blues. 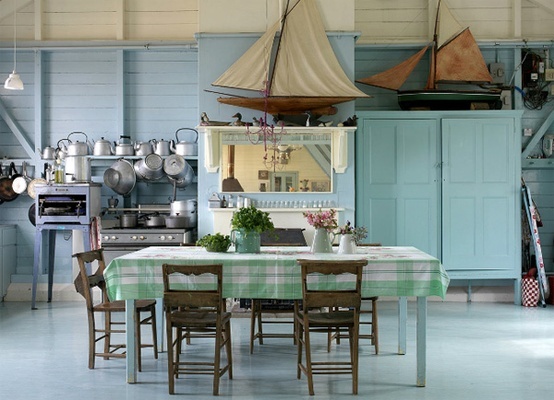 In fact, it almost looks as if the same can of green milk paint has attended to the front door, the dining table base, the kitchen island and other vintage items scattered throughout the interior. 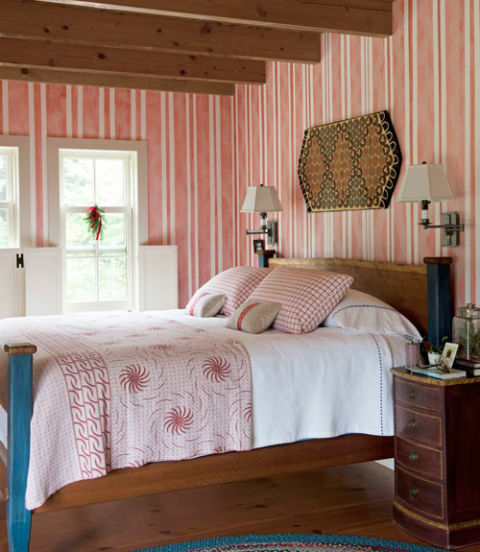 This color scheme is also repeated in the fabrics and rugs tying the rooms together. 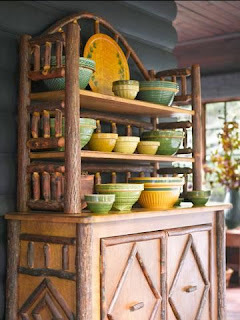 The log walls and wood floors provide a pretty but subtle backdrop, allowing these colorful items to shine. The couple enjoying their antique hickory game table amidst their charming collection of antique cabin furniture and accessories. Bandit the dog supervising. "Our architect thought I was a little nuts to keep the old cabin, and that it would have been a lot easier to start from scratch", Leslie admits. "But I love when people use what they have around. That's why folk art appeals to me. Something someone else might have thrown away, I'll always be happy to keep around me." 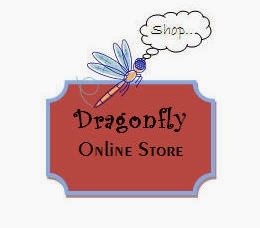 We always have a number of antique and vintage pieces in our online store. 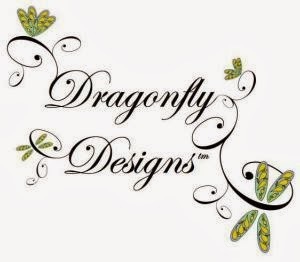 To view our current offerings, click here. 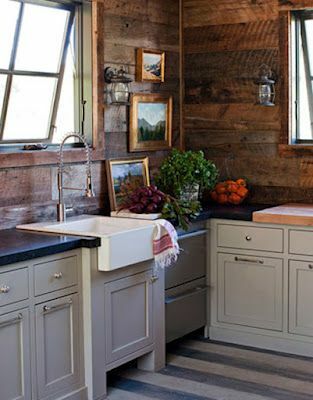 No pretentions, just rustic pretty. 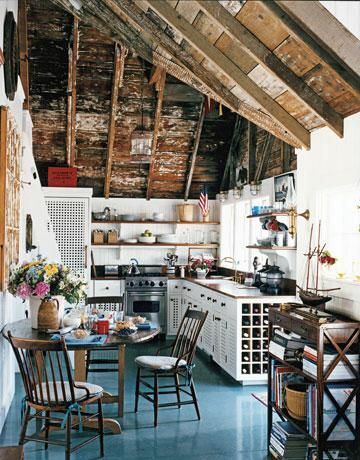 This kitchen looks like it was cobbled together over the years with unfitted cabinets. It wasn't though. Designer Colette van den Thillart found the main unit in the UK and had it shipped to be installed in her inherited Canadian family cabin. 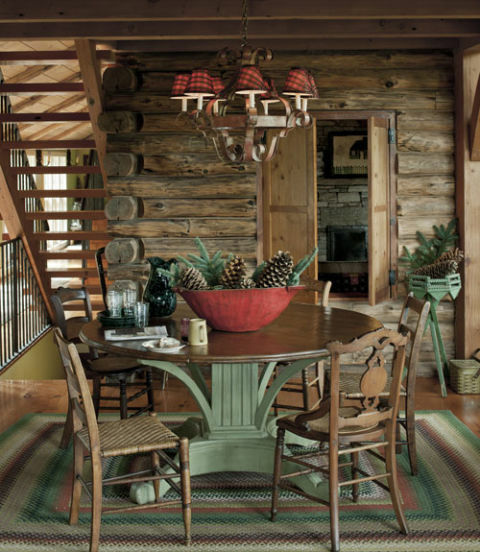 Each piece was carefully selected to keep the original old cabin look. 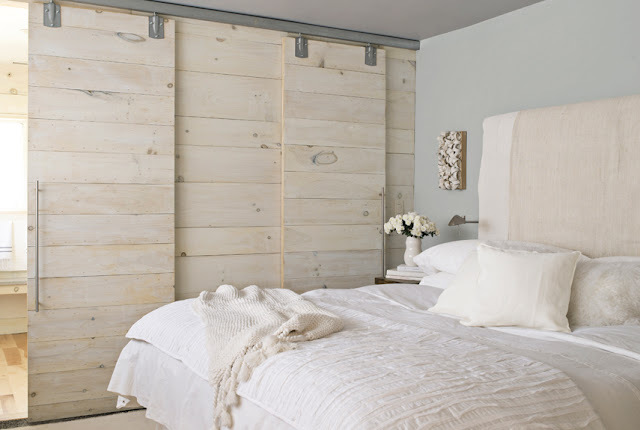 Love the creams, white, natural pine and the way these finishes mix with the sea glass paint on the old logs and bead board. My favorite detail? Why, the curved stained wooden back splash, of course! This kitchen is an example of how a few statement making pieces are all it takes. Here, old painted barn wood cabinets, some fabulous industrial style bar stools and two impactful old warehouse lights come together spectacularly in a simple, light and airy, rustic kitchen that is heavy on the charm and style. A great use of antique pieces. The lower cabinets were a former store counter which were cut in half and installed on either side of the range. A gorgeous stone back splash and a high impact hood featuring some old flea market applied woodwork and this small but utterly charming kitchen comes together with panache. 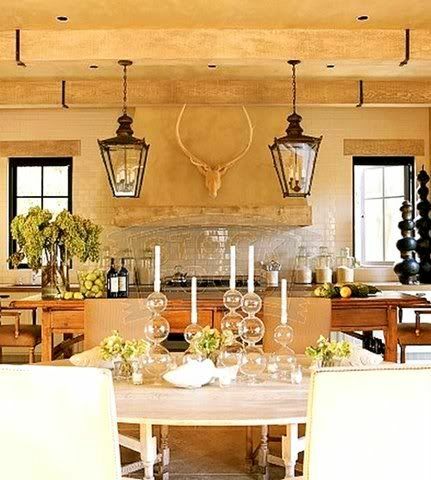 A sophisticated version of charm with rustic wooden beams, headers and trim around the base of the hood. Black leaded windows, iron strapping on the beams and two beautiful lantern pendants add touches of black to the otherwise cream and beige color scheme. Can you make out the word "stock" in the tile behind the cook-top? 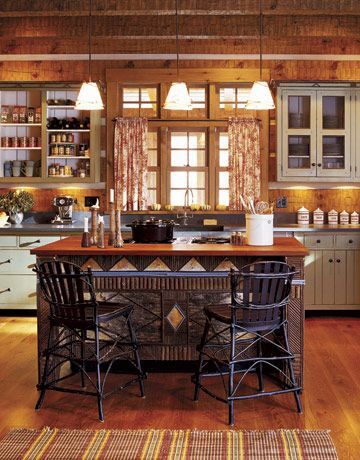 In this cabin kitchen, a wonderful Adirondack stick style island becomes a centerpiece. 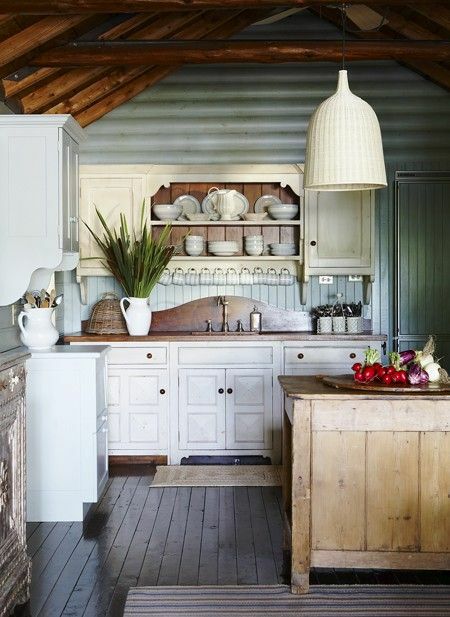 The sage painted cabinets and the pretty floral curtains are the icing on the cake. 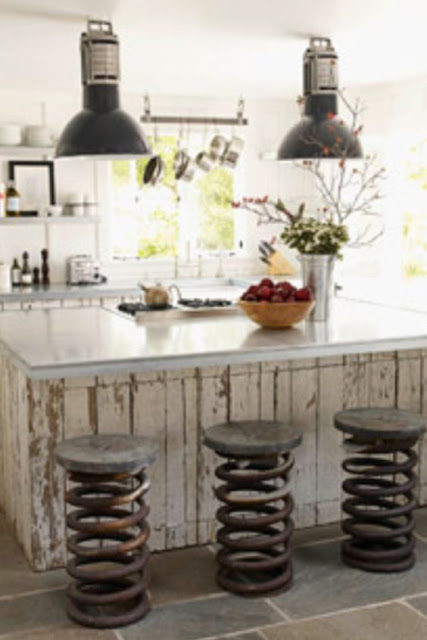 Bent willow bar stools available here. With a large old family camp, many would be tempted to modernize and update. I love the way this family has decided to focus on adding charm with pretty paint colors, accessories and to let an unpretentious but much loved space simply be what it is. And then there's the art of selectively updating, where new cabinets and appliances get tucked into a patina-ed older space and the charm lies in the contrast of new with old and the clean with the untouched and aging. A shiny retro Robin's egg linoleum floor, polished antique furnishings and the brightest of white paint all contrast with the aged and rugged upper walls and ceilings. Antiques and simple slipcovers in a lovely blue linen, a gorgeous hanging lantern. All this combine in a kitchen that contrasts luxury with simplicity. 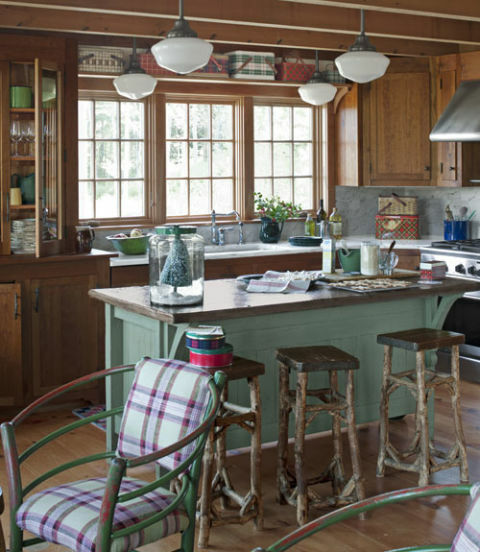 Hope you enjoyed seeing some of my favorite charming kitchens!